The artistic life of Danilo Picchiotti comes out of a desire to express himself without limitations of any kind, without the imposition of rules by schools or traditions, and without the constriction of thought or style that could possibly inhibit the free flow of emotion. Picchiotti’s art unveils a visionary world where the subtle search for perfection derives from the darker zones of consciousness and from this draws nourishment. Reviewing the creative history of the artist we find from his very first works up until his latest unsettling works distinctive traces that delineate his pictorial world. The rejection of a clear and definite form where one moulds ones artistic intuition is expressed in free lightning fast gestures without accepting any pictorial rules. The tradition refused is evident in an expressive variegated as well as a multi-formed world, suspended between intuition and abstraction, somewhere between matter and spirit, between the negation of the form and the figure. One thinks of the chaos of ideas, that slowly, a little at a time as if by magic take form as well as dimension, space and color. And that, the painting recalls the primordial myth of birth itself, almost the principle for which the breath of life always generates as well as orders matter into better evolved as well as organized forms. In this way out of the sub consciousness of the artist innocent pictorial gestures emerge almost primitively as he ploughs the canvas with uncontaminated force and purity. The unclear slowly becomes clearer, up until it finds its own form naturally. That which others search for with reason or by means of the logical route of experience, Picchiotti finds with the oblivion of himself and in the rejection of all relative experiences that might condition his choices. It is in this that his strength lays always refusing the plasticity of the representational with its possible links to the real world. The artist traveled pictorially through the route of informal, always following the voice of his own conscience. In his painting Picchiotti always searched for himself and the primary reasons for his existence; no research for easy effects of suggestions, but absolute creative liberty. This painter of the soul is always balanced between finite and infinite, always searching for his own interior truth. With this his rebel spirit always renewed by modeling or forming the matter of ideas becomes a new every time in a sort of primordial illumination. A strange mixture of new as well as antique, of the future and of the past, pervades the art of Danilo Picchiotti as if his works exhausted the entire cycle of his human life. The innocence that he always searched for becomes wisdom; the new that always animated the innocence of his consciousness becomes memory immediately but also becomes matter. Disorder becomes order. In synthesis, an artistic identity fully realized. The painter is shown in full-length figure, reflected in the mirror of his humanity, full-bodily; material strengths are portrayed in his dense painting, both body and soul are incorporated into a cosmic concentration of energy where centrifugal and centripetal forces are borne and meet together in a magical spiral, in vigorous caresses offered with broad gestures left on the spontaneous route of adventure and instant passion coming from far way and that finally finds its voice in painting. The Painter himself expresses his voice in this language recently established by the history of art, such as the powerful Surrealist degeneration of the magical deviance mimicking dreams and aiming at encircling the intimate universe through the so-called indirect procedures, i.e. techniques and practices presenting a mental vision, which does not belong to objective reality and absurd ghosts and ideas that inhabit intimate and secret worlds. Picchiotti’s consciousness as a painter is inspired by Surrealism and thanks to Yoga meditation he is now able to grasp the wisdom and the tranquillity of his existential anxieties that used to divert and confuse his pressing energies. Similarly, Pollok educates his high, visionary, dancing individuality to Surrealism, Cubism and Zen, guiding his soul during the unrepeatable adventure of his sweet painting, saturated with poetry and existence like a beat generation hero. Picchiotti adopts similar chromatisms, but his visual backgrounds are not exotic, he does not refer to African, Oriental or American cultures. Apart from Yoga and the international influences of his painting, his art education follows Italian trends. Picchiotti cites Burri as his major influence. Picchiotti feels closely linked to the Franciscan Gothic Burri and both share the cultural affinity of the Etruscan and Latin worlds, those ancient flavours and walls rich in history that encircle the borders of central Italy. 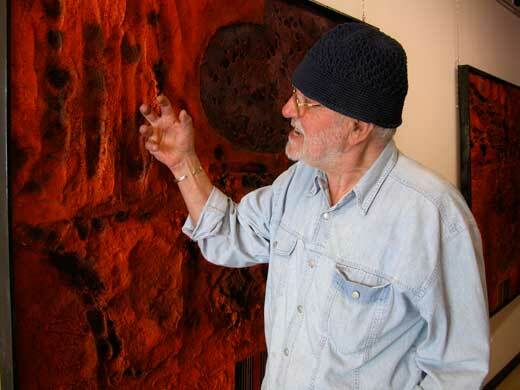 But between Burri and Picchiotti, in addition to their different personal backgrounds, there is definitely a different amount of adrenaline: Picchiotti’s peculiar extrovert energy cannot identify with the Franciscan Gothic works of Burri, often too sober and full of history and earthly depths. By association, Picchiotti’s painting can be compared to the art of Montanarini, a Roman painter himself, but Montanarini’s sense of composition and decoration is foreign to Picchiotti’s practice who has now moved his art gallery near Colle Val d’Elsa, in Siena, where he displays imposing works and large architecture designs imagined in his canvases that are often long and enriched by ancient paint mixtures prepared through long and patient rituals. The unique technique and long preparation matches the vigorous and quick movements and gestures executed without interruptions or second thoughts, an approach that highlights and clearly describes Picchiotti’s relationship with art. Therefore his painting tells a short story drawn from a long concentration: it is a highly sensitive moment, a fugacious blink, an unrepeatable physical and mental state, an acute peak of happiness, a flourishing gesture, an instant blossoming, a sudden spring, after a slow and powerful rising from the ashes.